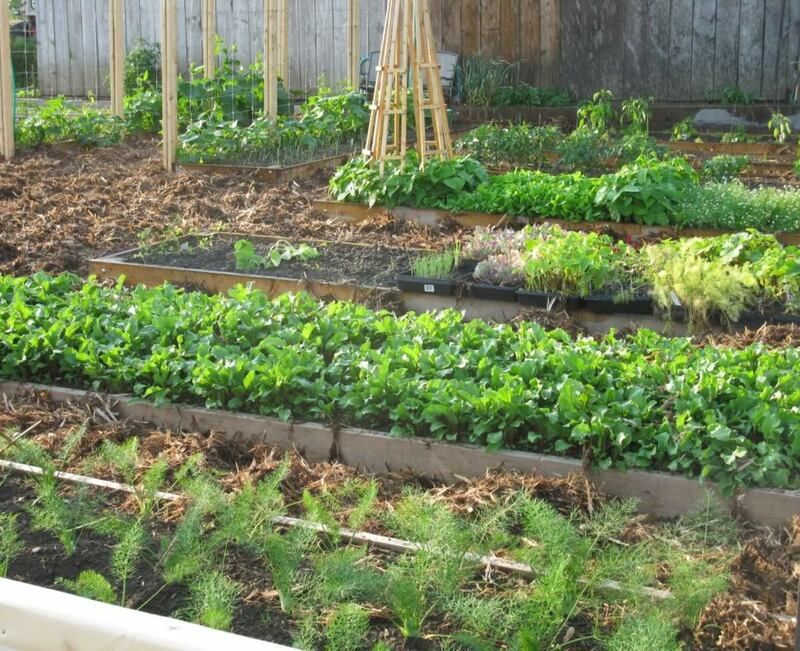 Raised bed gardening saves so much time and effort, there is no wonder more people are trying it. This is the third raised bed garden we have built in 10 years. The first one at this property. We are lazy gardeners and after a disastrous first year of veggie gardening in 2000 (when we mowed between the rows of veggies-the weeds and twitch grass were so thick) we got " The Vegetable Gardeners Bible" by Ed Smith and never looked back as we started the efficient and easy raised bed gardening. We have the odd, weather related ups and down like any gardeners but nothing soul destroying, overwhelming or anything that makes us want to give up. With raised bed and mulch we have no problems maintaining them pretty well weed free all organically, and it's a pleasure doing it. I`ll show you what we have done here. Though some of the filling and building stages we were too busy to take photographs! This garden footprint is about 60 by 60 right now with plans to put another row of long beds where the black plastic is in the outer edge next year. We decided this was big enough at the time (40 by 40ft) and that we should quit building and get planting. The previous 2 years, we had dithered long enough with a traditional style garden and everything got planted in July with varying degrees of success at harvest time. This garden was set up to grow excess for our chickens and to sell as well as feed our household. This is a very large garden and I wanted it ornamental with a central area for relaxing as the view is gorgeous to the back of our property. Because if the efficiency of the raised beds, I want you to know it can be a fraction of this size and still yield more than traditional vegetable gardening. One person successfully weeded this for a month at the beginning of the season and never got behind or spent more than a couple of minutes a day. After the first month, the vegetable plants out-competed the weeds and weeding was not needed. Once built, the bulk of the time was harvesting and enjoying the view! The "before" picture. We had been gardening this area with black plastic mulch for the past 2 years - so weeds seeds and perennial weeds were fairly clear. The area was level and sheltered by the drive shed to the North. We never make a bed wider than 3 feet. It is too hard on the back to reach in much further than that and if you step on the bed for access you'll compress the soil too much. We have tried 4 feet wide wides to reach across and the difference is noticeable. The path width between most of the beds is also 3 feet. Wide enough to walk comfortably and wheel a barrow. We put a wider 6 foot wide area where the trellis was going for squash and for an ornamental promenade. Actual layout and length of beds is really is up to you. I have always wanted an ornamental area in the centre to sit and have a cup of tea, or a central herb garden The first raised bed garden we ever did was a series of thirty 3 feet by 5 feet beds. 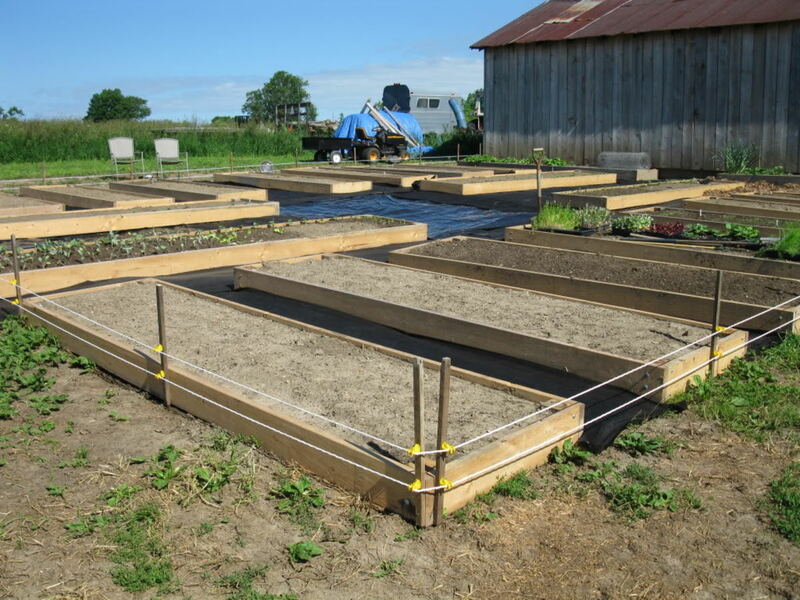 When making the beds so short, you gain flexibility for crop rotation and planning and access to beds, but you use more wood to get the same area of raised garden. The second garden we ever did was a series of concentric half octagons and building was slow and difficult. We had to use deck screws and calculation of the cut angles on the wood and path widths was not worth the hassle. Also when transitioning from one crop type to another in a bed it was angled and wasn't as neat or as easy to plant rows. This garden has 3'x12' and 3'x16' rectangular beds with six 3'x20's planned for the perimeter. We used less wood to get a good planting area, but the beds are still linear for putting multiple plants and varieties in one bed. The bed area is cleared of weeds, the wood frame placed in position using reference string lines. Then we used a 3 feet wide roll of natural thick biodegradable paper mulch. Flat cardboard boxes or newspapers can be used if you have them. We preferred unbleached paper with no ink and no joins for weeds to get through. Something that will decompose over time but not too quickly is best. 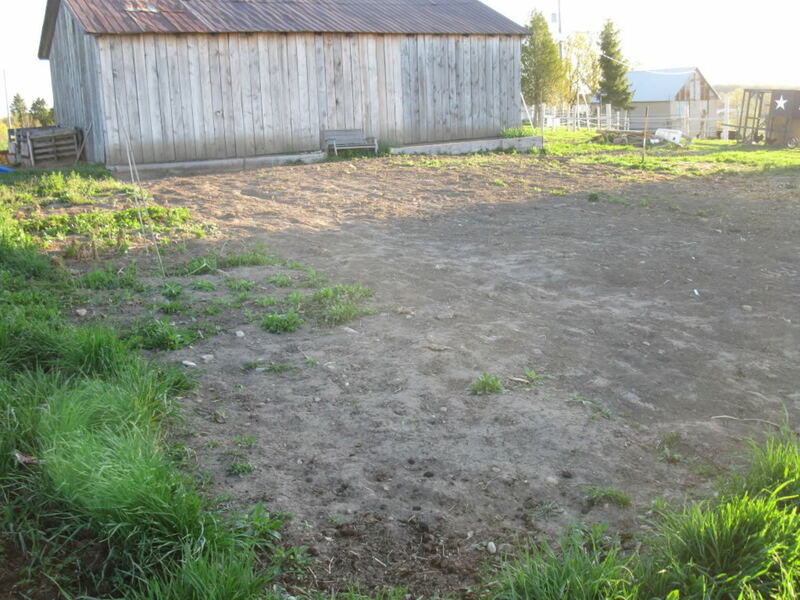 We then fill the bed 1/3 to 1/2 deep with composted cow manure or composted chicken manure and shavings. The top layer to fill the raised beds to just about the edge is topsoil. The soil will settle and sink over time so best to have them well filled. Up here in Zone 5, we have learned that merely screwing in the corners of the beds together is not enough. After 1-2 winters of frost expansion of the soil inside the bed, the corners are split apart if screwed with deck screws. We use carriage bolts and bolt both planks-sides of the bed to a cedar 4 by 4 post in the corners. You can see corner construction in the picture below. You can use lag bolts but I think the carriage look nicer. We now use single 2" by 8-12" planks for the bed sides. Saving money by making the beds with 2 by 4s stacked 2 or 3 high is no economy when twitch grass roots can get through the cracks between and establish in the bed. To stop the beds moving (in an aesthically pleasing way) we use 18" long metal rebar sledgehammered 12 inches down inside the bed and screwed to the inside of the bed planks with a metal plumbing loop. 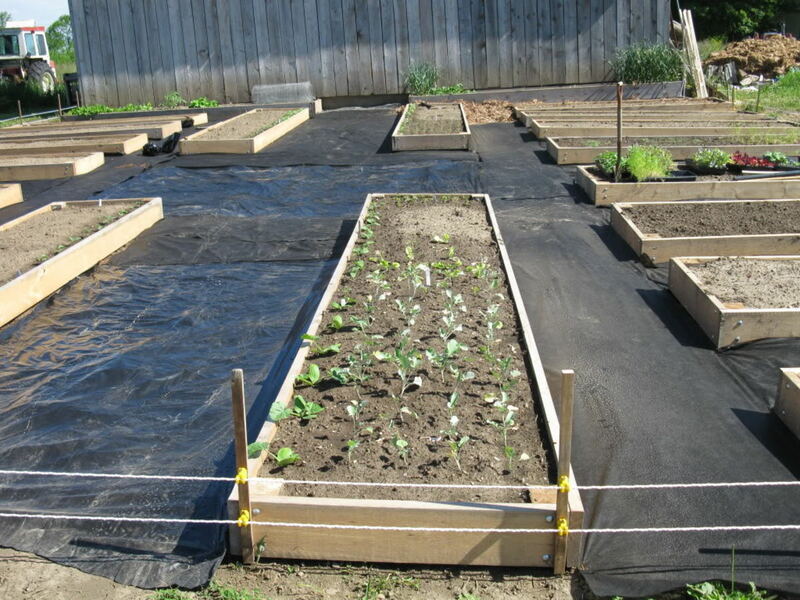 This stops the bed from moving and bulging with the frost and if one was willing to have them on the outside of the beds will be even more effective to stop the frost bulging of the long side walls from soil expansion in the winter. Wooden stakes hammered in to stop the bed moving rot off within a year or so if not cedar. We use either black plastic (with occasional holes punched in for drainage) or woven landscape fabric with a thick layer of cedar bark mulch. The 6 inch or deeper mulch keeps weeks at bay and the oils in in naturally repel pests. It is important to cover the underlying weed block as the woven fabrics quickly deteriorate when exposed to UV. You can mulch underneath the paths with newspaper or cardboard boxes instead but the tenacious perennial weeds may come through after a year or two. You could have paving slabs etc put down also but this is much more expensive. The heaviest duty trellis we have made is page wire stapled to a 2 by 4 trapped between another 2 by 4 of wood. 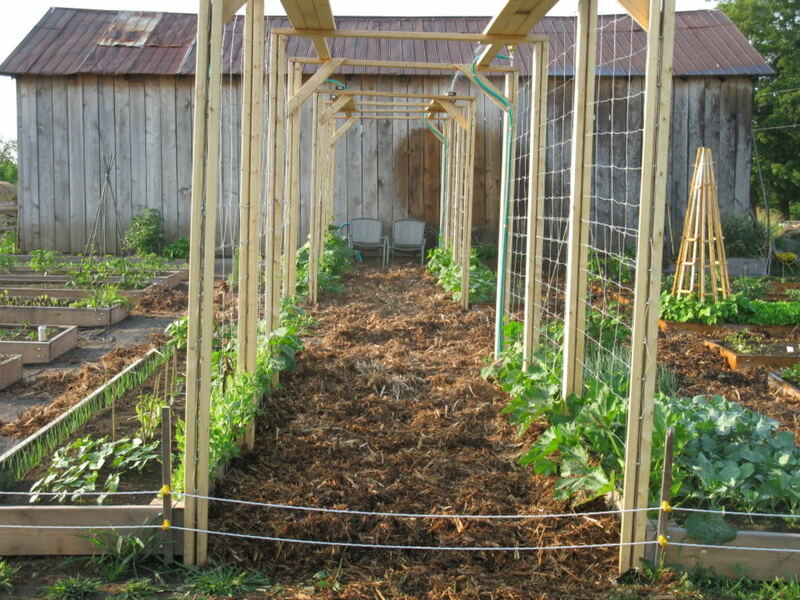 The trellis is screwed or bolted to a raised bed base for stability and neatness. We can grow squash, peas, beans and cucumbers, both pickling and English on them! Nothing sags and some of the squash fruits were 7 feet up! You can go 8 feet high for beans if you want these are 6-7 feet. 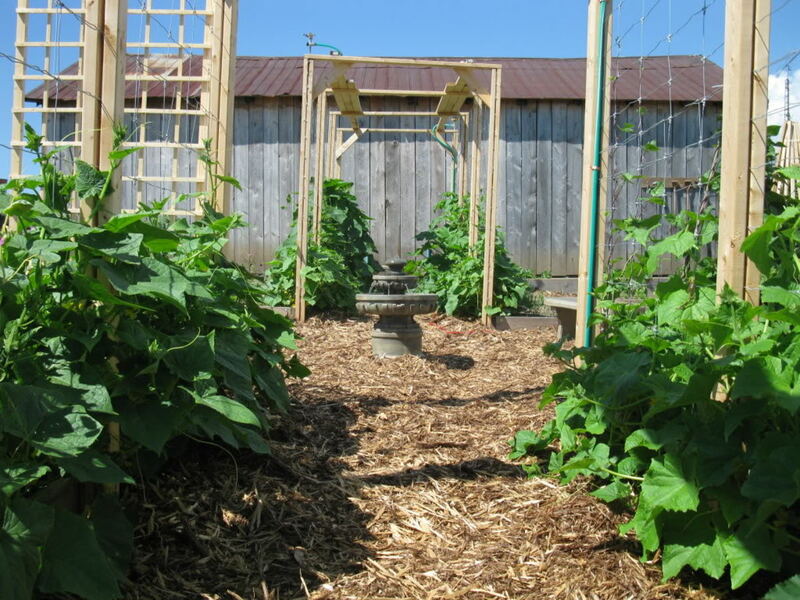 For runner and pole beans, we sometimes make a teepee, zip tied at the top, they are easy to move from year to year. Ripped down 2 by 4's to make vertical lattices are cheap and you can staple with a nail gun. Rotate crops each year - plants in related families shouldn't be planted in the same location-pests and nutrient needs are often common to the family and pests may remain for 2nd year while soil is sapped of nutrients. 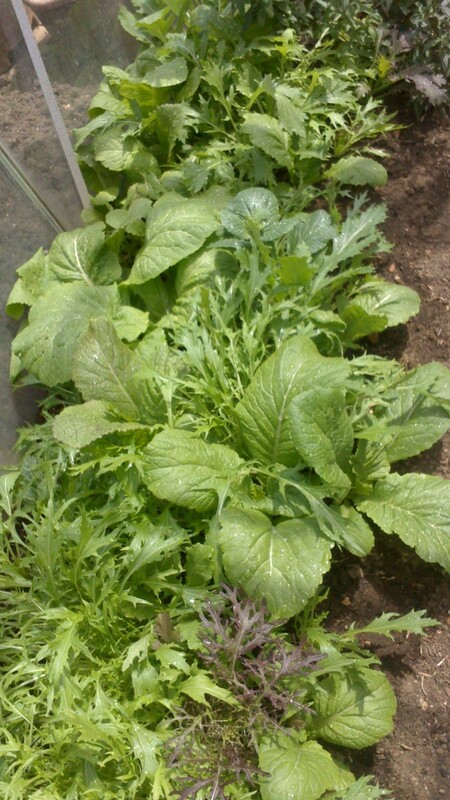 Companion planting -planting herbs or other specific veggies alongside your vegetables can help repel insect and animal pests. I have whole beds of flowers suitable for herbal teas like calendula and chamomile that also repel pests. 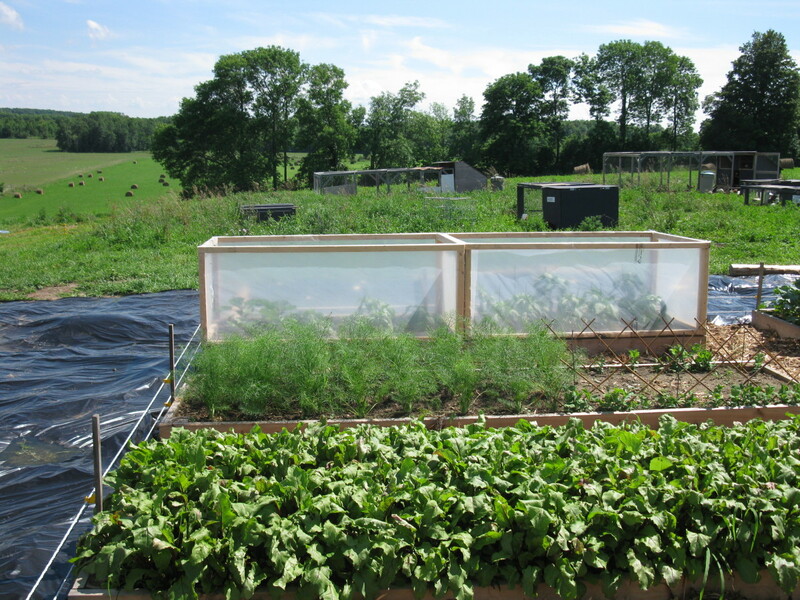 We also make light easy to move cold frames from clear plastic and wood 2 by 2s. Our location is windy and cool and in spring our proximity to Lake Huron can mean a slow start. These frames are made to match the size of the beds and we use a hook and eye setup halfway along the two long sides to keep them in position. 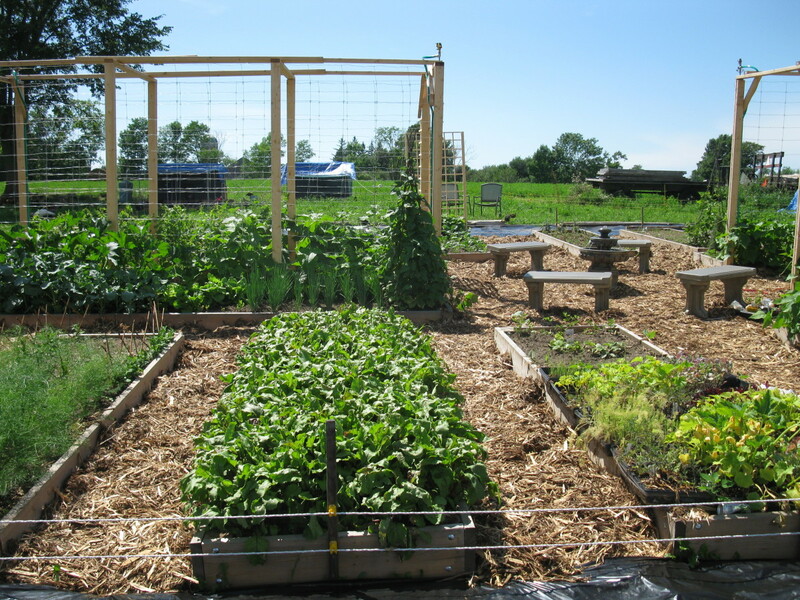 These frames can be reused and moved to other beds for crop rotation. We find if we use them all season for eggplant, peppers and basil, the yields are way higher. We will use them to start tomatoes and lettuce and move them off once it warms up in June. In hot years, there are definite advantages to having wooden tomato cages. Metal frames will burn the plants. Most heritage tomato plants are about 3 times too big and heavy for a traditional heavy duty tomato cage. So we used some scrap untreated hardwood from a local furniture factory and made these frames and attached them to the raised beds. Also see in the picture we have our tools hanging close by under the overhang from the roof, for occasional weeding. A beautiful productive garden to relax in! 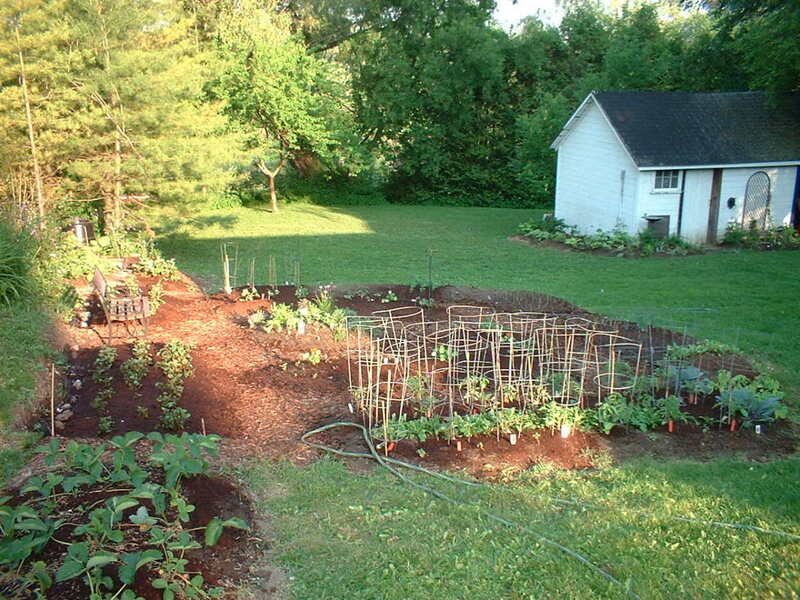 I prefer a vegetable garden where harvesting or relaxing is the bulk of the time spent. 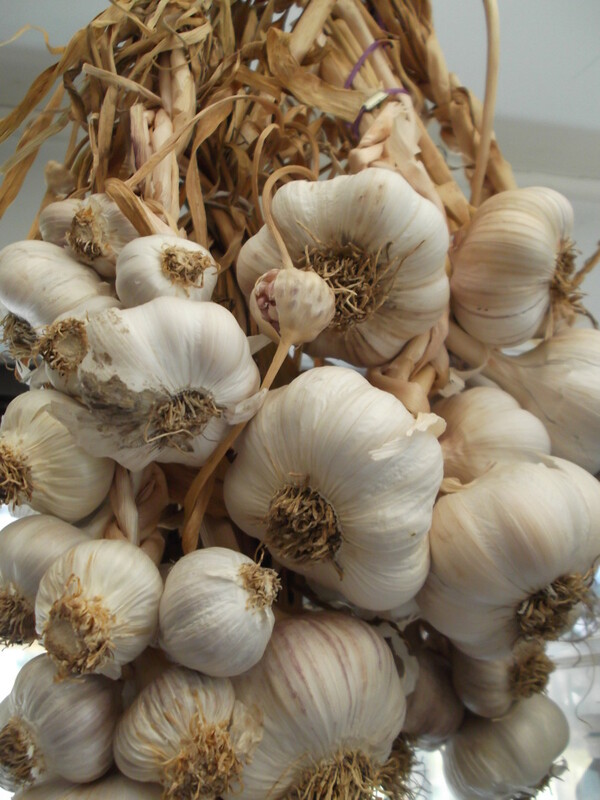 Not everyone can afford pesticide-free ecologically grown organic vegetables from the store but by growing your own fresh tasty veggies, you not only save money, but you know nothing has been sprayed on them, no waxes, pesticides, irradiation herbicides, or hormones. 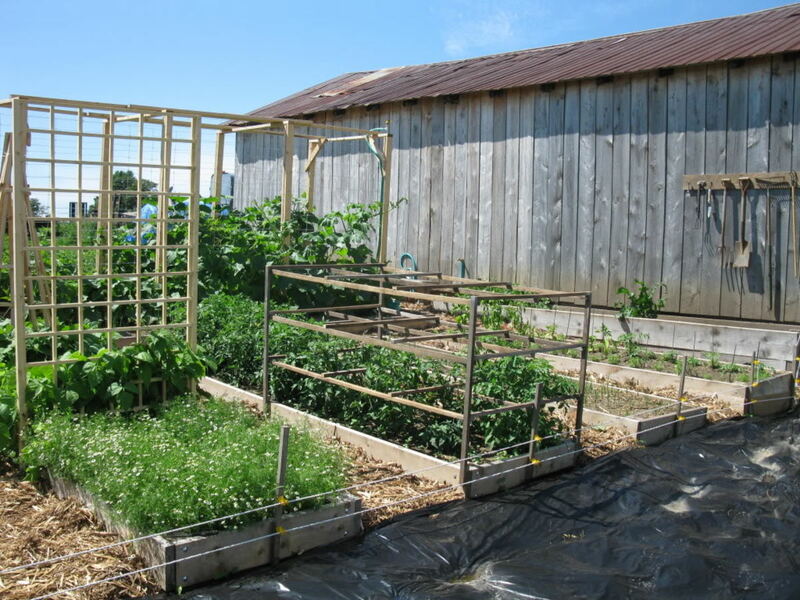 Growing an Organic Vertical Vegetable Garden on Trellis to Avoid Weeding. Even in a large garden with lots of space, vertical gardening will save your back, money and efforts while increasing your yields per square foot. Plants that most suitable for vertical growing are natural runners and vines. Ask any questions you have, or feel free to comment! Vote us up if this was helpful! I am planning a garden in the spring. 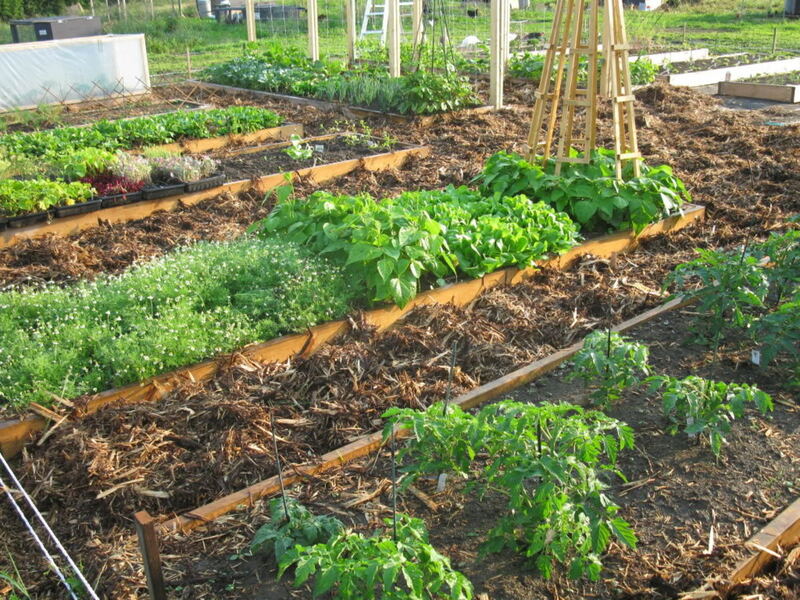 Perhaps raised beds are the way to go. You've got a fantastic looking garden; I'm impressed. 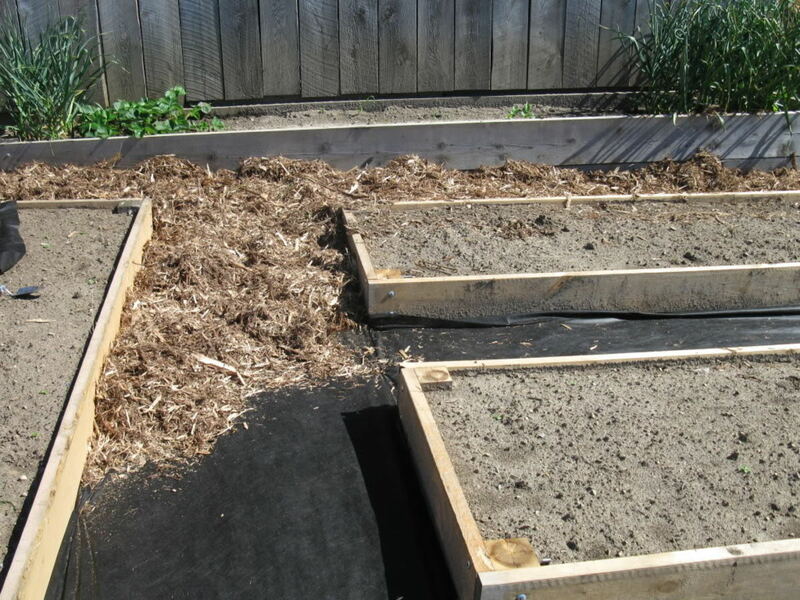 I have raised tiered beds that I assembled from a kit, and also find the raised beds so much easier to garden. Thanks. They make it so much easier! Hi there Joy. Sorry for the delay, i'm not getting notifications for some reason. It depends on the chickens! The smart stubborn ones (Basques) would go over that! We ended up with a third line another 9 or so inches above the top rope of the two, and it worked apart from one determined bantam hen! Now we use the poultry electric netting (with the smaller squares at the bottom) and house the chickens up to it, so it keeps them safe and keeps them out of the garden at the same time! Question- I see you put up the two electric fence lines to keep the chickens out. We just put it up yesterday, went to all that trouble and the chickens weren't even phased by it! They just walk right on it and through it! Did we do it wrong or is there some kind of trick to it? Did yours work here? Thanks! Your garden is beautiful! We used raised beds for years, but right now are on the ground- too big of an area to contain! Wonderful Hub. 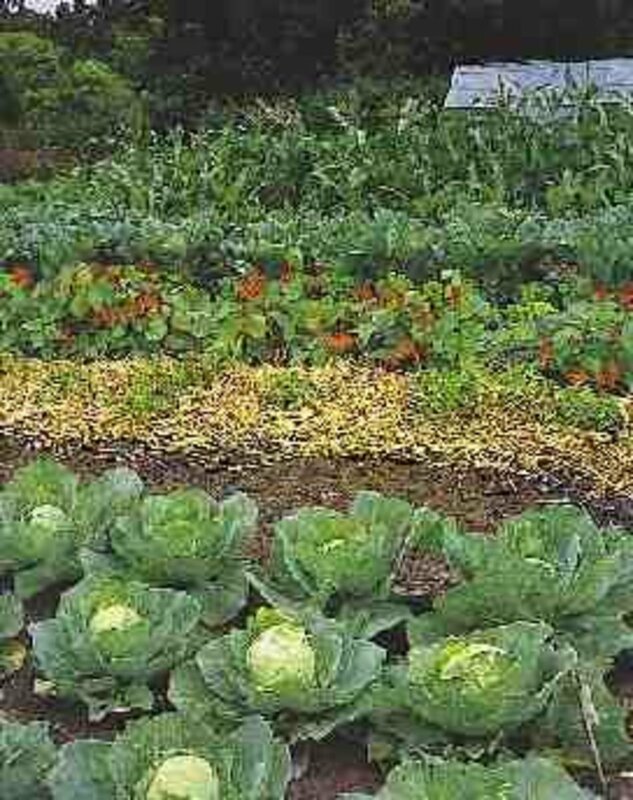 I have been reading up for some time on raised bed vegetable gardens as I plan one next spring, and your hub provides so much of practical details, I am feeling quite confident now. I look forward to more such Hubs from you. Voted up and useful. Thanks for SHARING! Thanks for your kind comments. I am glad it is helpful! It is a beautiful garden and I love to spend time in it! 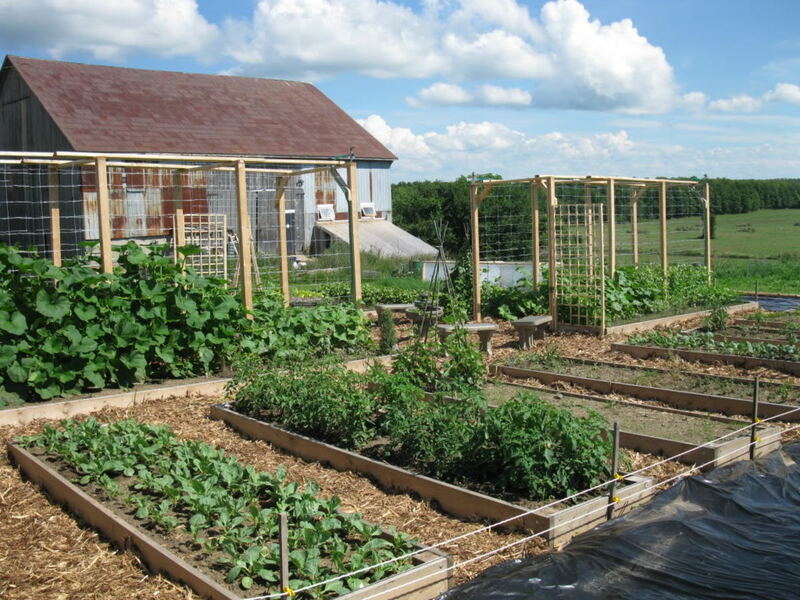 Great information here on raised beds and the trellises that look good enough to grow any vine crops. Cucumbers, beans, peas, tomatoes. Just anything. Thanx for the pictures, as well!